If the back-end service requires a non-Kerberos authentication, but the client application supports only Kerberos authentication, API Gateway can act as a Kerberos service, and mediate the authentication to the back-end. Client application: Supports Kerberos authentication. Back-end service: Requires non-Kerberos authentication (for example, OAuth or SAML). API Gateway: Acts as a Kerberos Service authenticating the client application, then authenticates to back-end service. A Kerberos client app, such as a standard browser, authenticates to API Gateway using Kerberos authentication. API Gateway then authenticates to the back-end service using a non-Kerberos authentication mechanism. Before you start configuration, you must have API Gateway installed on any machine with access to the Windows Domain Controller. The machine does not have to be a Windows machine that is part of the Windows Domain. 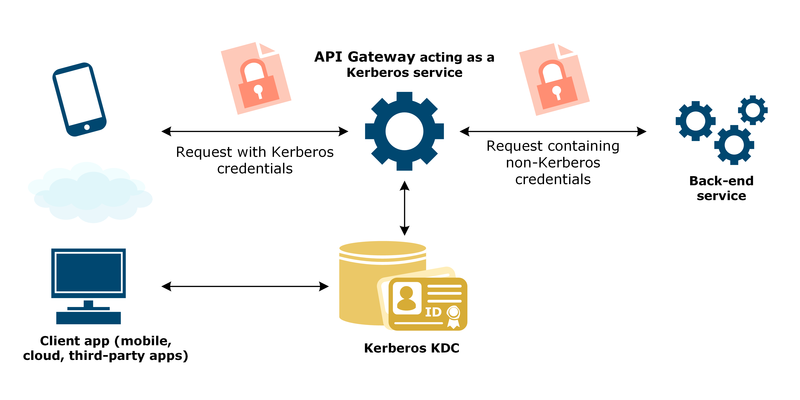 The connection between the client application and API Gateway acting as the Kerberos service is by default unsecured. For security reasons, it is recommended to enable SSL/TSL connection in the Kerberos service. SSL/TSL is configured in the SSL port on the Kerberos service, but you must also configure your browser separately to use SSL/TSL connection. For more details, see Configure browser authentication over SSL/TSL. In this example, a client application supporting Kerberos connects to the Kerberos service ServiceGateway running on the host machine gateway.axway.com connects to an existing back-end service. You can use the example names, or replace them with names of your own. The example Kerberos realm name AXWAY.COM is specific to the examples in this guide. Replace the example realm name with your own realm name.